Britain's biggest supermarket continues to improve its brand perception and has almost, but not quite, caught up with its rivals' average score, according to chief executive Dave Lewis. The former Unilever marketer has gained plaudits for his turnaround of the group since joining amid its corporate trust and customer focus crisis in 2014. The recovery has now notched up a tenth consecutive quarter of like-for-like sales growth. 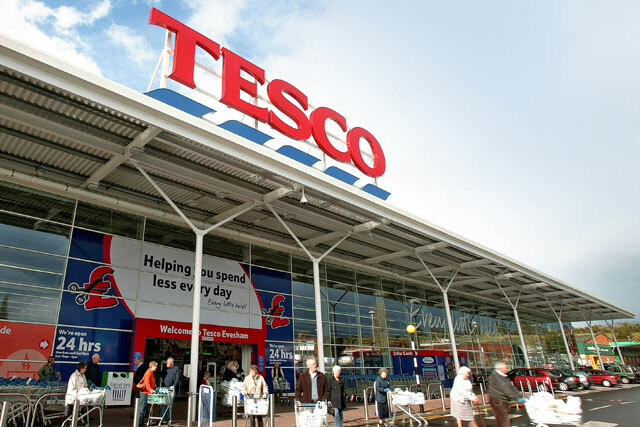 In addition Tesco’s brand strength "continues to improve", Lewis told Campaign on Friday, adding that the management was "very happy with the combination of the evolving ‘Food Love Stories’ campaign and our investment in Weekly Little Helps and Everyday Little Helps price plans". Tesco’s YouGov BrandIndex score has come tantalisingly close to overtaking the average score of three (unnamed) rival supermarkets that Lewis benchmarks against. "We’re basically neck-and-neck with our rivals," Lewis told Campaign on a morning media call, proving the claim later that afternoon by showing the graph above at the annual Tesco shareholder meeting. 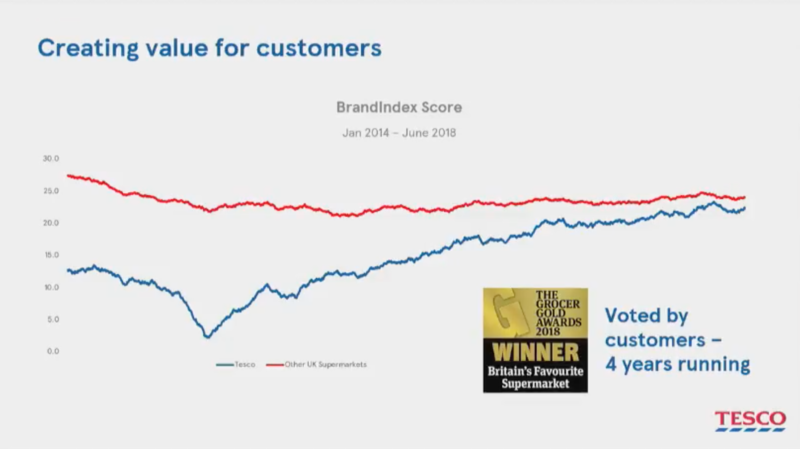 The graph pictures YouGov’s BrandIndex score, which is calculated by asking consumers about six metrics including brand reputation, favourability, quality and value. Getting Tesco above that red line would be a coup for the CEO, who said he is hoping for another boost as the big overhaul of the own-brand line-up concludes near the end of this year. Nearly a third of the 10,000 product lines have been refreshed so far. Two years ago Lewis described Tesco as a brand that had declined from being liked by consumers to just being tolerated. Asked now whether people like it more, he replied with an emphatic "for sure" – followed up with the data that its Net Promoter Score had climbed by five percentage points over the course of 2017. "As soon as the brand puts the customer back at the centre of everything it does, and in our case we differentiate ourselves by wanting to be more helpful, then the more helpful you are the more people engage with the brand. "That’s what’s driving the improvement in quality and value and the engagement in the brand. As you know these things are not quick processes but so far customer reaction to what Tesco has been doing continues to be positive."